One of the reasons for the devolution of the management of the Scottish Crown estate property to the Scottish government in April 2017 was because of the perception that the Crown Estate Commissioners in London focussed too narrowly on securing revenue, with little regard to community benefits and the public interest. The Scottish Crown Estate Bill that is currently before the Scottish Parliament is framed so that there is a move beyond profitability and so that other factors including regeneration, social well-being and sustainable development should be considered when deciding how an asset should best be managed. The concern over the conflict between revenue, community benefits and the public interest that lies behind the provisions of the Scottish Crown Estate Bill is not, however, new; it has important historical antecedents which relate to the Crown-owned foreshore, one of the significant assets within the Scottish Crown estate – Scotland’s foreshore is 19,509 km in length and around half is owned by the Crown. 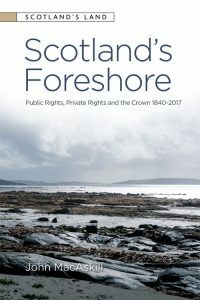 The historical antecedents are summarised very briefly below and are examined in detail in EUP’s new Scotland’s Land series book, Scotland’s Foreshore: Public Rights, Private Rights and the Crown 1840-2017. The book also examines, in detail, the nineteenth century battles between the Crown and private proprietors as to ownership of the foreshore, battles that played a significant part in the determination of the extent of Scotland’s foreshore in Crown ownership. Since at least 1851 it had been thought that there was a duty on the managers (at that time the Office of Woods and Forests) of the Crown-owned foreshore to exercise their management duties so as to realise the greatest amount of revenue. But it was decided in 1866 that the Board of Trade should assume management responsibility for the foreshore with a view to empowering the Board to deal with the foreshore in the public interest, rather than to extract the maximum revenue from it, as the Office of Woods had been obliged to do. The management of the foreshore was not, Thomas Farrer (the permanent secretary to the Board) said, to be ‘a matter of £ s d’. And a very important memorandum produced in 1866 by Farrer, said that it was important to avoid ‘the fatally erroneous [assumption] that the pecuniary interest of the public in the foreshore is the most important interest.’ The Crown Lands Bill 1866 contained provisions giving to the Board the necessary powers to deal with the foreshore in a way that was not constrained by the need to maximise revenue. But the Board’s best intentions were thwarted by a determined group of private proprietors in the House of Lords who succeeded in amending the Bill so as to leave the Board with the same powers that had been enjoyed by the Office of Woods. Somehow, however, the Board and its successors (responsibility for the foreshore passed from the Board to the Ministry of Shipping in 1939 and then to the Ministry of Transport and then finally, in 1947, to the Commissioners for Crown Lands) managed their responsibilities for the foreshore, in the public interest, even with the legislative restrictions that were the legacy of the turbulent peers. It was said that ‘no rigorous policy of getting the best return’ had been pursued by the Board and its successors. Or, at least, this was the case up to the late 1950s. It was in 1958 that the Commissioners were thought to be pursuing a policy of getting the best return from the foreshore without regard to the public interest, in contrast to their predecessors. The flash point was the foreshore at Milford Haven, and there were high level discussions at the Cabinet Office to consider how to deal with the situation. The Cabinet Office memorably recorded its view that it was illogical to treat the foreshore in the same way as other Crown estate assets and that the foreshore should be managed primarily by reference to the public interest. This was a major change from the Treasury view in 1865 that the foreshore should not be treated differently from other Crown estate assets. Thomas Farrer’s memorandum was spoken of in terms that there was much of value still in it. The result was that the Commissioners were threatened with losing management responsibility for the foreshore if they continued with their best return policy. In the face of this the Commissioners agreed to moderate their approach, and the new Crown Estate Act 1961 expressly provided that the best consideration provisions on any disposal (which to all intents and purposes were the same as those that had governed the managers of the Crown estate assets since at least 1851 and which the Crown Lands Bill of 1866 had been aimed at changing) should exclude any element of monopoly value. And there matters rested until, so far as Scotland was concerned, the conflict between the public interest and raising the maximum revenue again reared its head, leading to the view expressed by the Crown Estate Review Working Group in 2006 that the Scottish Crown assets, including of course the foreshore, would be better managed as devolved assets. It was thought that there was a stark contrast between the Commissioners’ revenue generating approach and the ways in which the public interest in the Crown-owned foreshore could be managed to complement the Scottish Executive’s policies that were designed to support rural, coastal and island communities and the public interest more generally. In 2012 the Scottish Affairs Committee voiced concerns that the Commissioners and the Treasury were adopting an over-rigid and self-serving interpretation of the 1961 Act that was against the public interest. Put bluntly it was thought that the Commissioners acted with a commercial mandate that was inconsistent with the public interest. 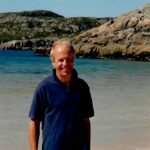 Finally, in 2017 the Scottish Crown estate assets were devolved to the Scottish Parliament, and we now have the Scottish Crown Estate Bill going through the Scottish Parliament with provisions that recognise, at least to some extent, the importance of the public interest rather than just profitability. Shades of 1866 and 1958. Thomas Farrer will be looking down with some satisfaction. 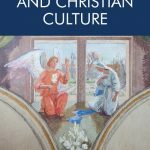 John MacAskill is a retired solicitor and an Honorary Fellow in the School of History, Classics and Archaeology, University of Edinburgh. He is the author of We Have Won the Land: The story of the purchase of the North Lochinver Estate by the Assynt Crofters Trust (1999) and The Highland Destitution of 1837: Government Aid and Public Subscription (2013).